This entry was posted in software, Uncategorized and tagged sync by pete. Bookmark the permalink. I use good reader all the time. 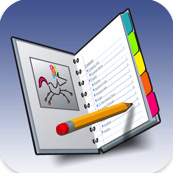 Wondering if circus ponies would really add much value for me in keeping client trial notebooks? I organize entire notebooks using GR. If I have hand written notes I scan and add them to the file. I have tried many notebook apps but always go back to GR. do you see value in CP above and beyond GR. A bit more follow up to my last post and how I use GR. I have my entire file scanned and made into a PDF. The PDF has bookmarks and sections within the bookmarks for easy reference. The PDF is ocr’d so it is searchable. As new documents get added to the file a larger PDF is made. I admit I don’t actually do the work of changing the file so maybe it’s a bit harder than I think. this method works quite well for me, but I am always looking for methods to improve upon the system.